Over 40 brethren attended the proclamation of Phil Stansbie as Worshipful Master of Lathom Abbey Lodge No 6286. Phil opened the lodge in due form and after confirming the donations as per the notice of motion made at the last lodge meeting to be made later in the evening of £2,300 Nigel Kent the director of ceremonies announced that Kevin Poynton, Assistant Provincial Grand Master, stood outside the entrance of the lodge and demanded admission. Phil said he would be delighted to receive him along with Graham Chambers and the other grand and Provincial grand officers. 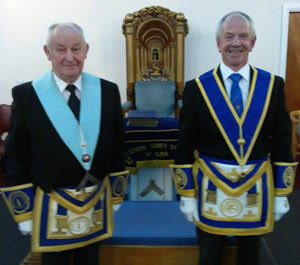 Phil then duly opened the lodge in the second and third degrees. Nigel proclaimed Phil as Worshipful Master for the ensuing year, to the master Masons, fellow crafts and entered apprentices. The working tools of a master Mason were presented by Nigel Kent, the working tools where presented by Mike Smith to the fellow crafts and John Plummer presented the first degree tools to the entered apprentices. After investing his officers for the ensuing year, the address to the brethren was given in fine style by Kevin Poynton. 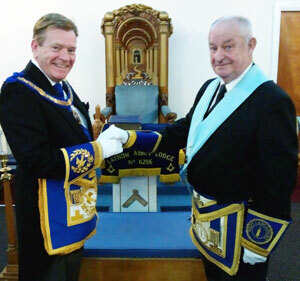 Kevin then gave the best wishes of the Provincial Grand Master, Tony Harrison and he thanked Phil for agreeing to stay in the chair of King Solomon for a second year to enable the junior brethren to progress through the offices. After the lodge closed the brethren retired to the bar for refreshments before enjoying a delicious three course meal. Responding to the toast to grand officers, Kevin congratulated and thanked Phil for staying as WM for another year, especially as it was 40 years ago when he was first installed as WM. Pictured from right to left are: Steve Clarke, John Roberts, Graham Chambers, Kevin Poynton, Phil Stansbie, Nigel Kent, Martin Walsh and Malcolm Alexander. Kevin, as he usually does, had the brethren laughing and at points crying with laughter as he made his response (sadly and to save one brother from being named for wearing a pink shirt at the festive board, Kevin’s words are not included here). Phil is planning to do a sponsored exercise bike ride of 80 kilometres in November to mark his 80th Birthday and to raise funds for the Ormskirk Masonic Hall – over £200 was raised during the meal and sponsor forms are available in the hall. The brethren at the festive board.